I had an opportunity to check in with Chef Flint to find out more about how he got his start in the industry, what it means to be part of the team that gamers so much recognition, and his personal food memory. Behind the Pass: When did you discover that food was something you were passionate about? Chris Flint: It sounds cliché, but it all goes back to watching my mom cook for me every night when I was young. I would watch her, and asked ten questions for every step of the recipe. I started playing around in the kitchen, trying to copy the dishes I’d seen her make, and sometimes, she was even brave enough to try them. Then, I began discovering new ingredients that opened up all kinds of new possibilities. An old bottle of liquid smoke that I found in the back of the fridge would find its way in to a lot of things. I would put together multi-course tasting menus for my mom before I even knew that there was such a thing. When my grandparents would visit, they always treated my mom and me to dinners at the local “fancy” restaurants. I was blown away by all the new flavor combinations and the seeing artful plating for the first time. I was really excited about cooking and food, but it still didn’t seem like an attainable career. Growing up in south Florida, I had never heard of a culinary school. I thought I had a better shot at being a pro skater than a chef. BtP: Did you have any restaurant experience prior to head off to culinary school? What was it like? CF: Two amazing jobs. My first was a server at a retirement home when I was 15. I got to rock a cool teal cummerbund and work with my friends. What else could I want? My favorite memory was the time one of the cooks, Miss Martha, made me an entire hotel pan of bread pudding for my birthday. My second job was cooking at Johnny Leverock’s seafood house. It was really more of a shack than house. We didn’t have a “Chef”, we had a “Kitchen Manager”. We played classic rock on the radio during service. I got promoted to broil station, which entailed putting raw fish on a conveyor belt, waiting for three minutes and fifty seconds, and taking the cooked fish out of the other side. BtP: You went to the French Culinary Institute. Can you talk a little about your experience coming up through culinary school? CF: Culinary school was very beneficial to me. I had an instructor named Chef Veronica who taught me for 3 of the 4 levels. She was so tough. I really appreciated that. She really understood the intensity of the professional kitchen and always held her students to that higher standard. BtP: If someone came up to you today and asked you for advice on starting a career in the culinary industry, what would you say? Would you suggest culinary school, or perhaps working in the industry instead? CF: I think school is important; it gets you in the door places that you normally couldn’t walk into. And in today’s flooded job market, it’s nearly impossible to secure a position in a good kitchen without culinary school. So now everyone’s going to culinary school. I think that what some of the younger cooks lack now is patience. Many cooks think they will be chefs in a couple years, and that if they stage at the right place, then that’s all it takes. They forget that they need to be amazing craftsmen before they can ever begin thinking artistically. This takes years of monotonous work to refine that skill. I have cooks that get bored on a station after a couple months, but they still have not mastered the techniques that the station demands. My biggest concern for young cooks is to not rush their career. The journey is equal in reward to the destination. If you hate working long hours under stress and you just want to hurry up and be a “chef” already, maybe this isn’t for you. BtP: Eleven Madison Park was just named the #4 restaurant in the world, one up from last year. You’ve been serving as Chef de Cuisine at EMP for the last several months. What’s it like to be part of the team that holds the distinction of being considered arguably the best restaurant in the United States? And, can you talk a little about the amount of work that goes in to obtaining that type of recognition? CF: I started as a cook at EMP in 2008. This is when we still had 3 NY Times’ stars and no Michelin stars. We wanted a 4 star review so badly, and the pressure was intense, but ultimately, we got it. Then our focus became Michelin stars, and got them too… This restaurant has such an amazing culture of team work and goal setting. One of our greatest strengths is the leadership of Chef Daniel and Will. They inspire a team of 150 people to systematically achieve each goal we set. It has been an intense 5 plus years, but also the most rewarding of my life. Being able to be in London and receive the Number 4 ranking was such an honor. We all understand what a huge responsibility we have to the whole industry to live up to that honor every day. It’s incredibly humbling. BtP: It’s pretty clear that lovers of food have great memories from their past dealing with food, usually something that maybe even led to them deciding to go in to the industry. Do you have a particular food memory that really stands out as a favorite? CF: Not one in particular. My favorite food memories involve friends, food and drink. In that order. Having friends over and cooking for them is probably my favorite. It’s instant gratification. I cook it, check for seasoning, feed my friends and see them happy. It’s the best. 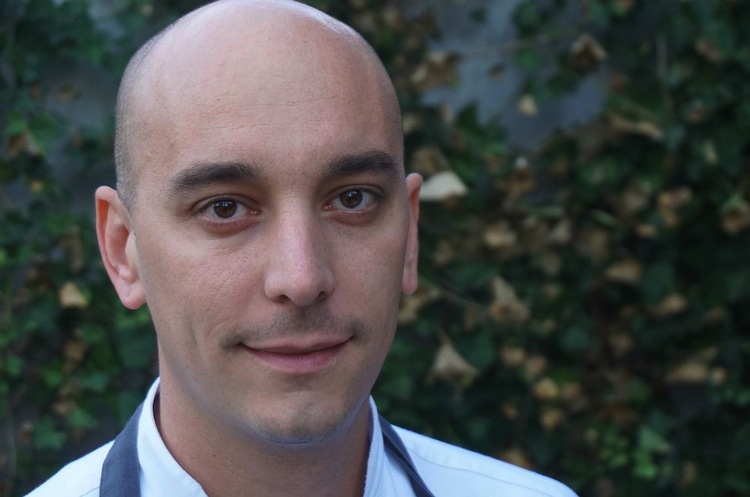 Chris Flint currently works as Chef de Cuisine at Eleven Madison Park, located at 11 Madison Avenue in New York City.